One of the ideas behind the blog is to observe the everyday, to stroll the streets of the metropolis noticing the little things that are missed by most and examine them with a view to gaining a deeper understanding of Japanese society (in this sense, I am very much influenced by the notion of the flâneur or flâneuse). A good example are the tiny red torii gates (discussed here) strategically placed to deter passers-by from urinating or dumping rubbish. 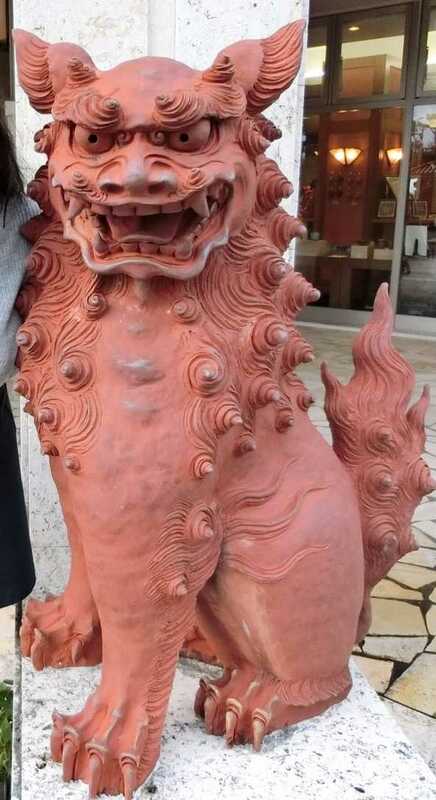 Today's object of interest are komainu (狛犬) or lion-dogs, pairs of wooden, stone, or metal animals typically guarding and protecting the entrance to a shrine or sometimes temple. In this sense, they are similar to the pairs of foxes (introduced in a previous post) which are a common sight at temples and shrines dedicated to the Goddess Inari across Japan (including the most famous of all, Fushimi Inari Shrine in Kyoto). 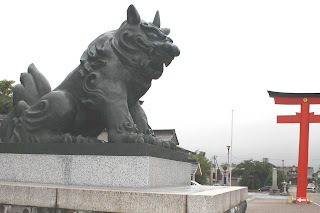 Sometimes these komainu can be enormous. In Yamagata City, a new pair of komainu made from metal were unveiled to guard the Shrine for the War Dead (Gokoku-jinja=護国神社) produced using a local cast/mould technique in the aptly named Dō-machi (literally "Bronze neighbourhood"). It is said they will last "18,000 years." 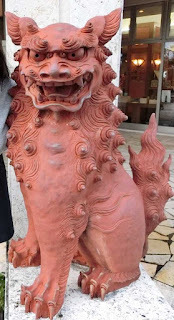 Unlike foxes, komainu are also seen (in miniature) at the entrance to regular houses and even rooftops, especially in Okinawa where they are called shīsā (シーサー) and are found all over the place (often made of red clay). 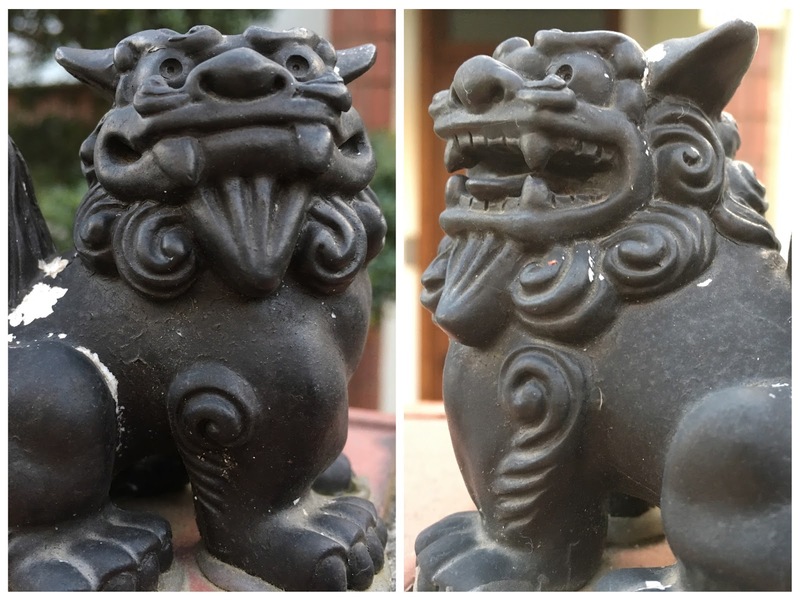 One interesting feature of these beast pairs is that the lion-dog on the left typically has its mouth closed while the one on the right has its mouth open. The open mouth is said to be pronouncing the first letter of the Sanskrit alphabet (a) while the closed mouth one is pronouncing the final letter (um/n), giving the sacred sound "Aum/n" (sometimes written Om) which is said to represent the beginning and end of all things. In everyday conversation, this has a positive meaning: if a couple or group perform an action together seamlessly, almost telepathically, for example in sport, it is refered to as aun no kokyū (あうん[阿吽]の呼吸). Unfortunately, the word Aum has a different, darker connotation for most Japanese: Aum Shinrikyō (オウム真理教) is the name of the doomsday cult which carried out the 1995 sarin Tokyo subway attack which killed 12 and injured nearly 1000. 23 years on, speculation is rife that preparations are now being made to execute the 13 members who were found guilty of the crime, including blind guru Asahara (yes, Japan still has the death penalty). What was particularly shocking for Japanese was that many of the perpetrators were young elite post-graduates from Japan's top universities. There was much soul-searching over why this was and reasons posited included the post-war spiritual vacuum, alienation from an overly-materialist society, and loneliness/lack of community due to rapid urbanisation.